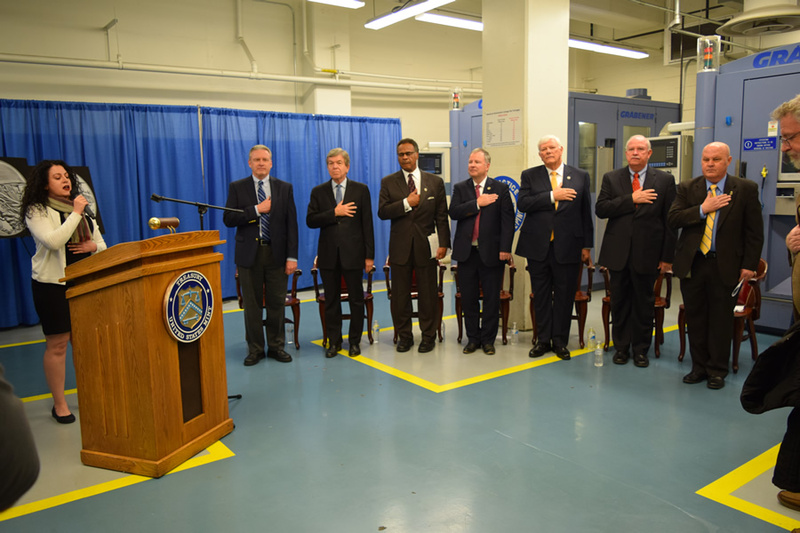 On Thursday, Nov. 28, officials from the United States Mint hosted a ceremonial strike event for the 2018 World War I Centennial Silver Dollar commemorating the 100th anniversary of America’s involvement in the First World War. A newly-minted World War I Centennial Silver Dollar. The coin will be released on Jan 17, 2018. U.S. Mint photo by Sharon McPike. Guests at the ceremony included three sponsors of the legislation authorizing the commemorative coin, the dollar’s designer and sculptor, the chair of the WWI Centennial Commission, and the grandson of a famous World War I hero. United States Mint sculptor-engraver Renata Gordon sings the National Anthem during the World War I Centennial Silver Dollar strike ceremony. U.S. Mint photo by Sharon McPike. 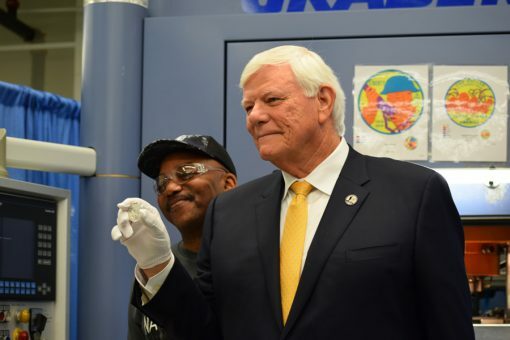 Gerald York, grandson of WWI hero SGT Alvin York, holds the World War I Centennial Silver Dollar he struck at the U.S. Mint in Philadelphia. U.S. Mint photo by Sharon McPike. 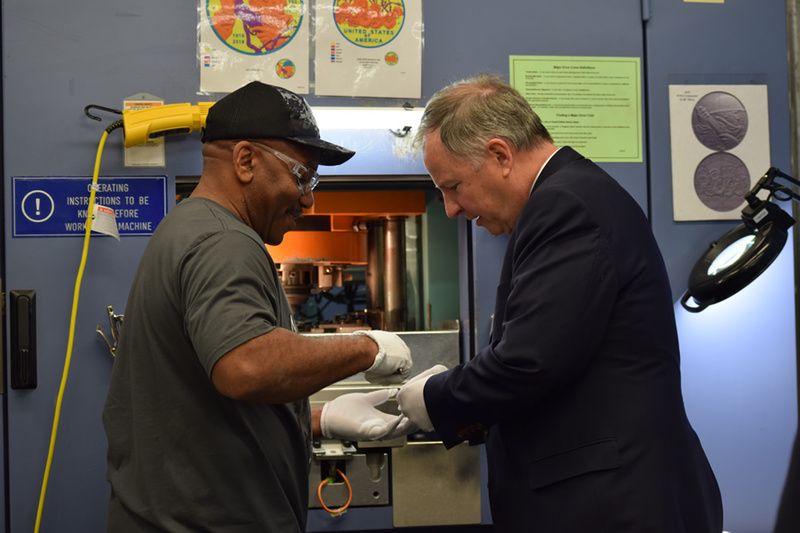 U.S. Mint Coin Press Operator Kenneth Holland hands Congressman Doug Lamborn (R-Colorado) the World War I Centennial Silver Dollar he struck at the U.S. Mint in Philadelphia on Nov 28, 2017. U.S. Mint photo by Sharon McPike. 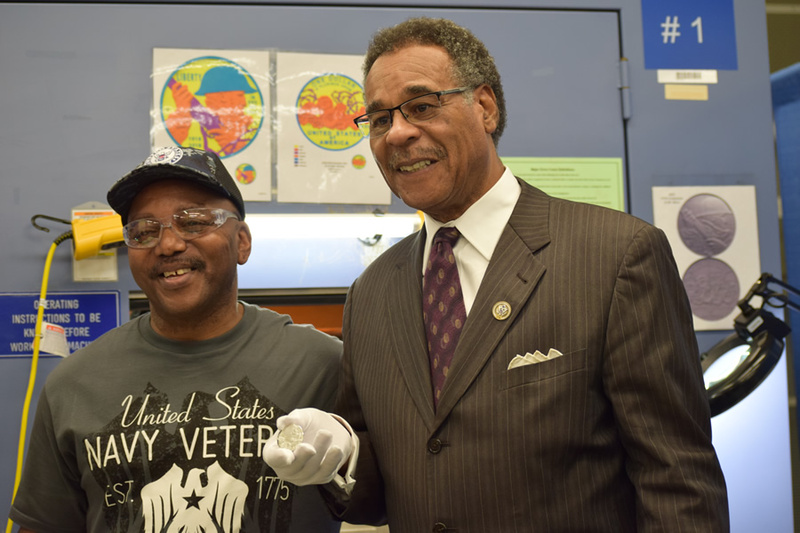 U.S. Mint Coin Press Operator Kenneth Holland stands with Congressman Emanuel Cleaver, II (D-Missouri) holding the World War I Centennial Silver Dollar he struck at the U.S. Mint in Philadelphia. U.S. Mint photo by Sharon McPike. 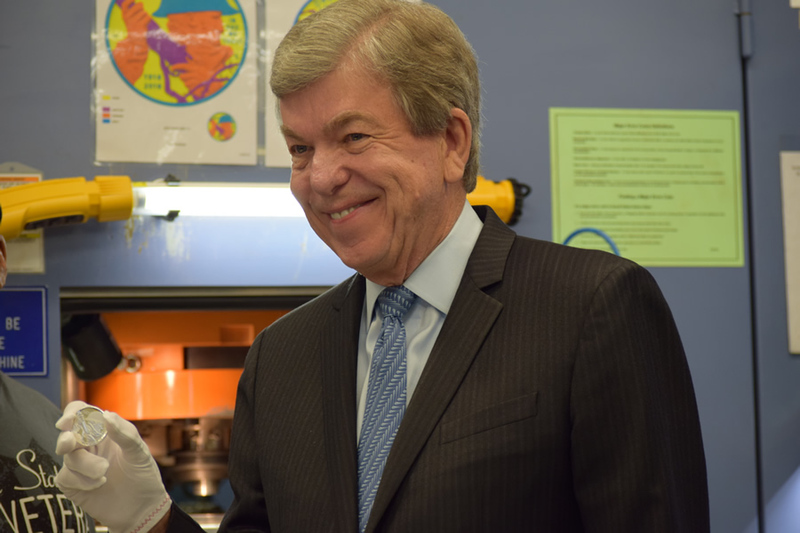 Senator Roy Blunt (R-Missouri) holds the World War I Centennial Silver Dollar he struck at the U.S. Mint in Philadelphia. U.S. Mint photo by Sharon McPike. U.S. World War I Centennial Commission Chair Terry Hamby holds the World War I Centennial Silver Dollar he struck at the U.S. Mint in Philadelphia. U.S. Mint photo by Sharon McPike. 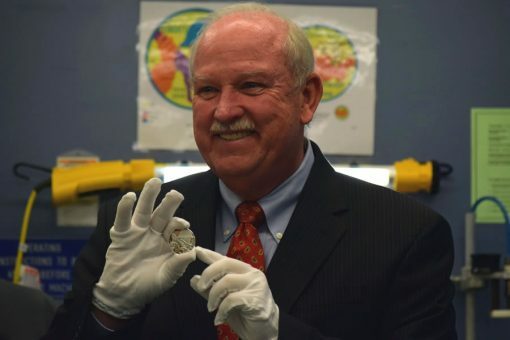 U.S. Mint Police Chief Dennis O’Connor holds the World War I Centennial Silver Dollar he struck at the U.S. Mint in Philadelphia. U.S. Mint photo by Sharon McPike. Gerald York, grandson of WWI hero SGT Alvin York, holds a newly-minted 2018 World War I Centennial Silver Dollar. 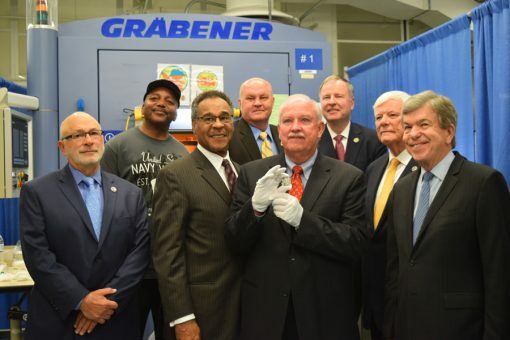 He is joined by (l to r) Daniel Basta, U.S. Foundation for the Commemoration of the World Wars, U.S. Mint Coin Press Operator Kenneth Holland, Congressman Emanuel Cleaver, II (D-Missouri), U.S. Mint Police Chief Dennis O’Connor, Congressman Doug Lamborn (R-Colorado), U.S. WWI Centennial Commission Chair Terry Hamby and Senator Roy Blunt (R-Missouri). The commemorative coin will be released on Jan 17, 2018. U.S. Mint photo by Sharon McPike. 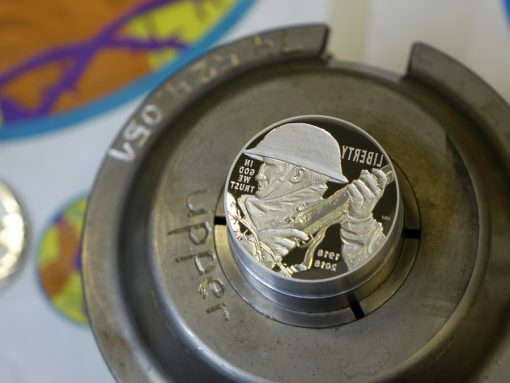 LeRoy Transfield created the silver dollar’s designs and recently retired United States Mint Sculptor-Engraver Don Everhart sculpted them for coins. They were selected by the Treasury Secretary based on winning designs from a juried competition. Transfield’s obverse or heads side design, titled “Soldier’s Charge,” depicts an almost stone-like soldier gripping a rifle. Barbed wire twines appear in the lower right-hand side. Inscriptions are LIBERTY, 1918, 2018, and IN GOD WE TRUST. Poppies have been used since 1921 to commemorate soldiers who have died in war. 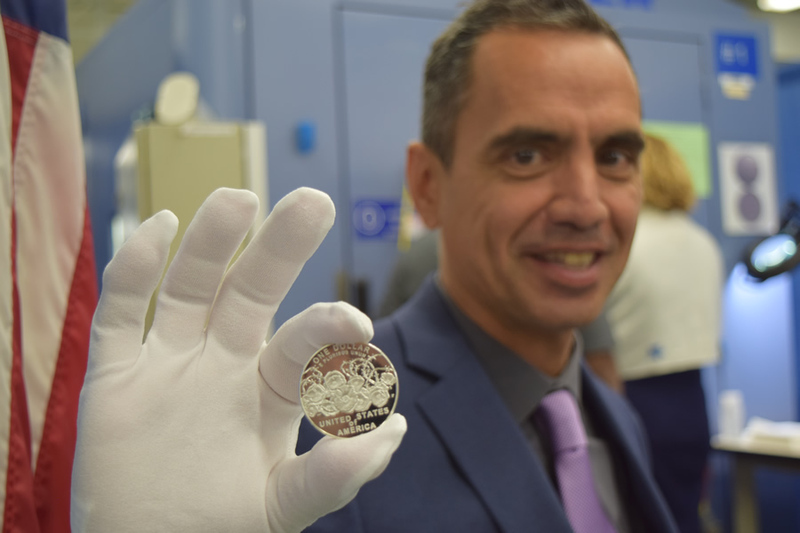 A World War I Centennial Silver Dollar die is displayed following the ceremonial striking at the U.S. Mint in Philadelphia on Nov 28, 2017. U.S. Mint photo by Brian Martin. 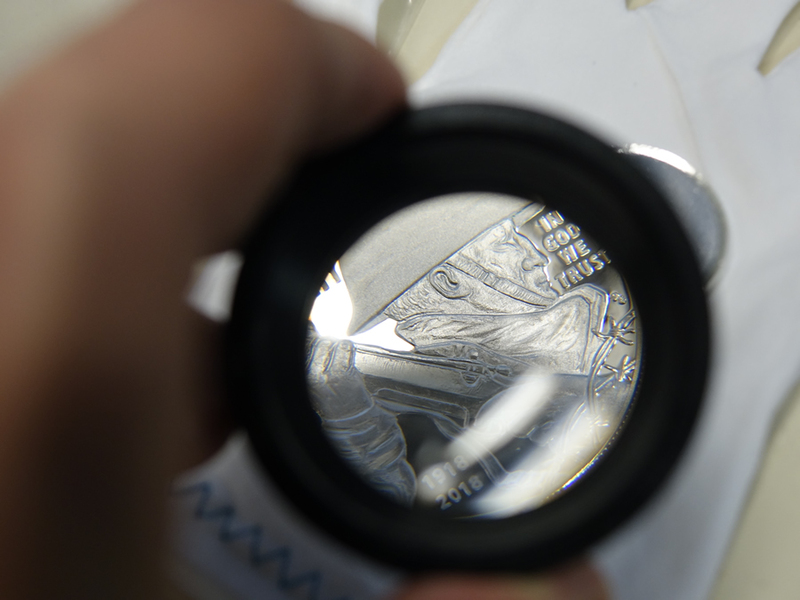 A newly-minted World War I Centennial Silver Dollar through a magnifying lens following the ceremonial striking at the U.S. Mint in Philadelphia on Nov 28, 2017. U.S. Mint photo by Brian Martin. The barbed wire design continues onto the coin’s reverse, which is titled "Poppies in the Wire." It shows abstract poppies mixed in with the wire. Inscriptions include ONE DOLLAR, E PLURIBUS UNUM, and UNITED STATES OF AMERICA. 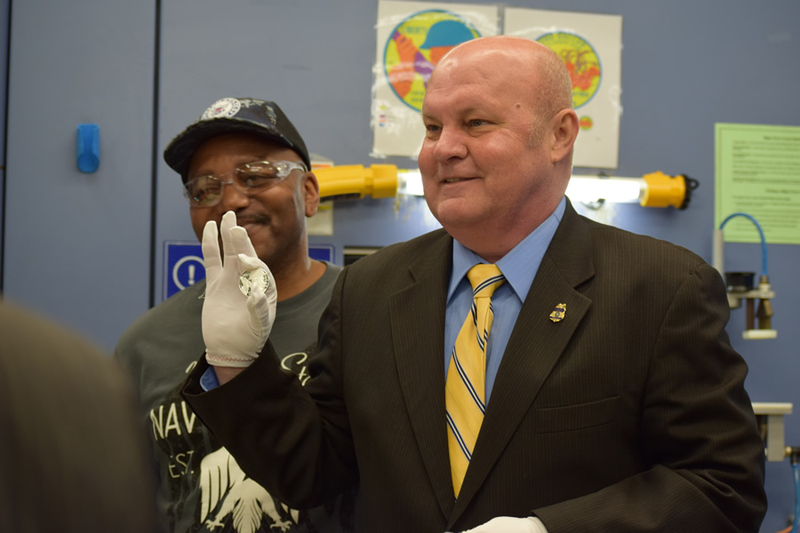 LeRoy Transfield, winning artist who designed the World War I Centennial Silver Dollar, holds a newly-minted coin following the ceremonial striking at the U.S. Mint in Philadelphia on Nov 28, 2017. U.S. Mint photo by Sharon McPike. The U.S. Mint will begin selling a pair of WWI Centennial Silver Dollars on Jan. 17, 2018. Available qualities will include the collector finishes of proof and uncirculated. Their prices have yet to be announced. Surcharges of $10 will be collected on each one sold with proceeds, after associated costs, paid to the United States Foundation for the Commemoration of the World Wars to assist the World War I Centennial Commission in memorializing the centenary of the war. 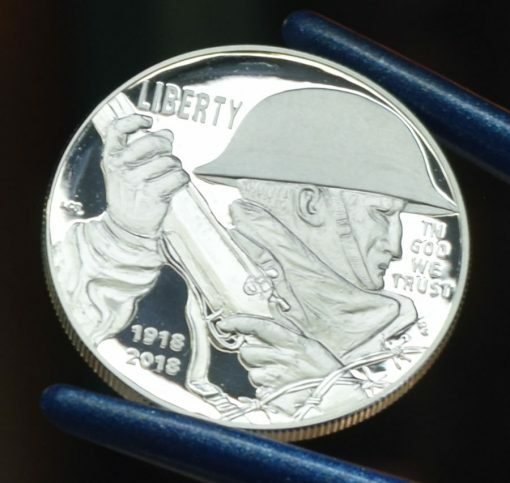 The U.S. Mint in 2018 will also produce and sell companion WWI silver medals honoring the Army, Navy, Air Service, Marines, and Coast Guard.. (See these medal designs.) Each medal will be paired with a World War I Centennial Silver Dollar and offered as a special set. Wouldn’t it be nice if the mint would slip a silver eagle from Denver in the silver reverse proof set next year? One certain Senator look,s like he smoked a big fat ””Blunt””” in the back seat of his limo, before he got into the *Philly mint, or is that what happens when you fake ”’smile”’ to much, just like Batman*s arch enemy the guy with the ”green” hair. LOL. He looks like a televangelist asking for money to save your soul ! I hope they checked his pockets before he left the Mint! What a clown face. It takes practice to fake smile like that & get away with it. LeRoy used himself as a model it appears, a real fuguly coin……somany nice medal renditions & we get this? YOUR mint @ work………….. Blout is smiling as he made his ma$ters happy w/the marvelous tax increase, oops cut package for Apple, BofA, etc. They KEEP SALT deductions, we don’t we are only people you know, when is the Trump Plutocracy Coin? Yeah, now that you mention it. it looks like the so called artist/designer LeRoy maybe he did a self portrait. probably took a selfie and worked from there. I am astounded that this self promotion got past the 3 CCAC political appointees who judged the contest, along with others …. and to rub salt in the wound of those wishing to get the medals instead of this POS “coin” are forced to buy a coin for each medal!! The Mint obviously is aware they got a coin that s*cks big time and need to goose up the sales by forcing folks to buy one for each medal purchased. Good o’l monopoly power at work ..
And the Mint posted a photo of the “artist” posing with the reverse of the coin … thereby making a direct comparison between his and the “soldier’s” likeness a little harder. One (like myself) would have just looked at the photo and moved on .. but I think the Mint might see the similarity too and did not publish that shot .. sad! I can’t believe they actually minted this coin. Terrible obverse design doesn’t even look like a Doughboy. Everything is wrong, what an embarrassment for the Mint to issue such a mess, The helmet, the uniform. the eyes, the nose, the left handed soldier holding the right handed Springfield rifle incorrectly. Looks like he is running away and not charging. A complete mess / a failure of a design. Who is running the US Mint, someone who does not know anything about WWI and what a Doughboy’s uniform and helmet looks like. 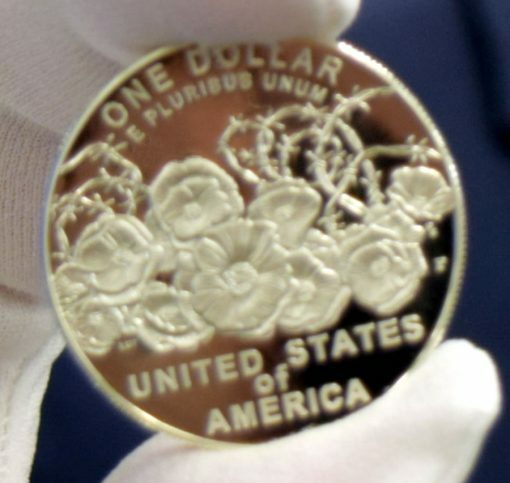 Another massive embarrassment for the US Mint. What an awful looking obverse, please no more ugly incorrect designs. Good review of the design. Isn’t the CCAC supposed to review and decide on recommendations for coin designs? Maybe they didn’t for this one or nobody cared enough to research themselves or knew enough to point out those glaring errors. Reviewing the designs of a commemorative coin law enacted by Congress should be required for at least the authors of the bill as well. But then again they’re probably so intent on blocking their political counterparts’ activities and raising money for their next election they can’t be bothered. I read somewhere that the CCAC only sent 3 reps to the Mint’s juried design competition and all three were political appointees!! So apparently CCAC was not given the designs to comment upon and recommend. This coin is so bad the Mint has to pair it with the medals (which look way way better) in order to goose what will probably be pitiful sales.